Hegel HD2 DAC review | What Hi-Fi? Hegel is not terribly well known in the UK, but it has a considerable audio heritage. Indeed, the Norwegian company made its first DAC separate almost 20 years ago. This little box is clearly aimed at the computer user. At the back, alongside stereo analogue and digital coaxial outputs, you’ll find a USB connection, through which you can send 24-bit 96kHz audio files – and via which the box also gets its power. Choosing compact dimensions and attention to performance over any frills where design or specification is concerned, the people behind Hegel are most proud of the fact that all the products the company makes are designed in-house. 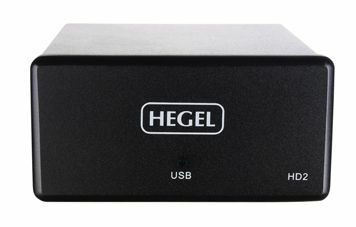 In the case of the DACs, and this, Hegel’s entry-level HD2, that includes the company’s own clocking system. The DAC’s clock aims to reassemble the information that it is sent, remove the ‘jitter’ introduced by your computer and send it out much closer to its original form. That, at least, is the theory. Playing a 320kbps file of Kanye West, Jay-Z and Beyoncé on Lift Off from the Watch The Throne album, the Hegel does a fair job of delivering the necessary punch and weight. There’s breadth and depth to bass notes, while it just about uncovers the necessary level of agility and detail. Switch to Hans Zimmer’s excellent Inception soundtrack – often used in the What Hi-Fi? Sound and Vision rooms for product testing – in uncompressed WAV form, and the HD2 doesn’t quite reveal the leap in quality we hear elsewhere. Ultimately it can’t quite deliver the goods with dynamics and detail, and the HD2 sounds less exciting, engaging and, ultimately, fulfilling than its best rivals. We don’t mind low-frills if it’s high- performance, but this Hegel DAC needs to be better to stand out from the crowd.